Marietta is steeped in history - museums, historic sites and markers, walking tours and more all highlight the stories of Marietta's past. Downtown Marietta is a treasure, preserved since Marietta's founding in 1788. Businesses launched and grew along the Ohio River and expanded further into the streets we get to walk today. Our downtown businesses are not just the caretakers of our historic buildings, but they are, in and of themselves, history's creators. It's hard to believe that Civil War-era businesses still stand today, but Baker & Baker Jewelers on Putnam Street is ready to celebrate their 99th Anniversary! And, if we extend Baker & Baker Jewelers even further to include Peddinghaus Jewelers, a business the founders of Baker & Baker had purchased in 1918, it can be said they are celebrating their 151st Anniversary! Many of you know the Hall Family in Marietta - Owners Nancy & Larry Hall with their daughter Charla greet customers day in and day out of their historic storefront. Their commercials are loved, their support of our town is known, and their passion for downtown is unquestionable. In celebration of Baker & Baker's 99th Anniversary, we had the opportunity to capture some reflections from owner Mr. Larry Hall. Read his reflections below, give their Facebook page a like, and mark your calendars to celebrate the 99th Anniversary of Baker & Baker Jewelers! It's hard to believe that 99 years ago, Baker & Baker Jewelers launched as a business. What is the history behind the founding of Baker & Baker? It was actually 151 years ago. In 1866 - the Civil War had just ended and a year before Abe Lincoln was President) - Peddinghaus Jewelers was established in Marietta. Later, in 1918, Walter and Henry Baker purchased the Peddinghaus jewelry store known today as Baker & Baker Jewelers. 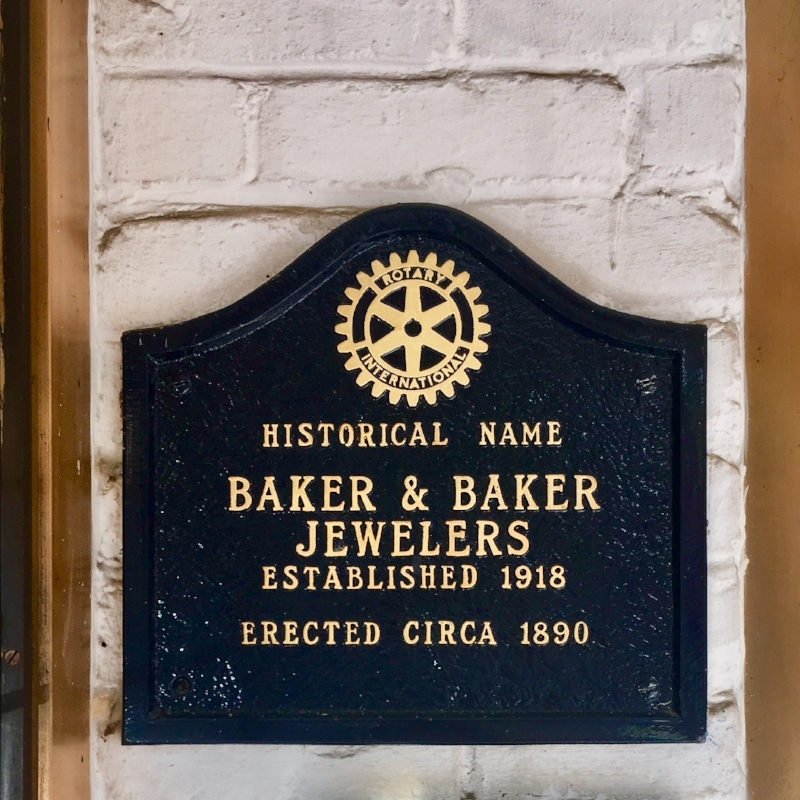 Thus, 99 years ago this November, Baker & Baker in downtown Marietta has been a continuing jewelry business without a break. Downtown Marietta has changed significantly in the past 99 years. What has it been like as a business trying to succeed despite the changes? I am humbled by the word “success”. Success in business is measured so many different ways. For example: Are you a part of your community? Are you getting the word out about what your business is offering? Does your business create an object of desire to your customers? Does it resonate? High standards and basically doing the right thing for your business and your customers is paramount. So, success…it’s a never ending quest. Over time, you've developed a strong base of community support. What do you think sets you apart from other jewelers in our area? “…Setting us apart..” has never been part of our business plan. Our plan has always been to create the highest standards in the jewelry industry. Then, to maintain those standards by way of representing our products and services through unwavering integrity and superior quality. Just doing the right thing. Of course, earning the title of Certified Gemologist Appraiser, which is the highest educational honor in our industry, also. I guess that sets us apart, somewhat. How would you describe Baker & Baker Jewelers to potential new shoppers who haven't yet heard about your business? We have fun shopping and we create some of the most beautiful jewelry in the world, and we represent that fairly. One example would be like Hearts on Fire Diamonds to Alex and Ani bracelets. Most stores don’t even know some of our unique designs and exquisite jewels exist. We represent value, high standards, and thus our customer satisfaction is our avant-garde. The ability to participate in downtown events is a great benefit to the downtown business owner. What would you say some of your favorite events have been thus far? We love all the special events. We are so pleased to see our Main Street, Tourism and Convention Bureau, and Chamber combining their promotional efforts for the betterment of our community and town. Moonlight Madness is a lot fun for our customers and fruitful for us. Being in business for 99 years is bound to build a significant body of knowledge when it comes to being a business owner. What words of wisdom would you share with aspiring business owners, interested in opening a business downtown? What “words of wisdom” do I have to offer to other businesses? Just keep reinventing yourself and your goods and services - tell everyone what you are trying to do, aka: marketing. And establish “grit” by continuing to plow away! Oh yeah, don’t be afraid to ask for help. That’s a sign of strength. Is there anything you wish the Marietta community knew about your shop, about downtown, and/or about owning a local business? Yes. We are supportive and are ingrained in the Ohio Valley community like most of our residents should be and could be. We are a small business that cares about our town and our customers and have made that a 99 year tradition. There’s more to a local purchase than just buying something. It’s supporting our local schools, our local government, and our local economic engine of businesses. As for Amazon - not much local revenue support - They are threatening the vitality of our small communities. But, so did shopping centers, then big box stores, then malls and now the internet. There’s room for all as we continue to reinvent ourselves with help of our customers and friends.